In October, French authorities deployed trucks and bulldozers to raze the migrant camp in Calais. On the morning before the demolition began, hundreds of migrants and refugees lined up on the camp’s perimeter, waiting for government buses that would relocate them to one of 451 so-called Welcome Centers in towns and villages across France. Those who left early in the process were those who left willingly, carrying backpacks and duffle bags filled with what belongings they had. Others refused to go, despite threats of detention by French police. The press cast them—perhaps not wrongly—as dreamers unwilling to relinquish their hopes of reaching the United Kingdom. I volunteered at the camp in August. For weeks, I worked with a few aid organizations, including Jungle Books, a French-English bilingual school on the camp’s south side. There, in the middle of a ring of trailers housing ramshackle desks, chalkboards, and shelving units stacked with battered novels donated by British families, I met a twenty-four-year-old from Darfur whom I’ll call Benjamin. He entreated me to return each day so that he could improve his English, even though he was nearly fluent. In the days that followed, Benjamin did not complain about where he lived. He’d left his home in Darfur in 2014, after his family’s farm was burned, his brother was arrested, and his mother was killed. One night, after dark Benjamin offered to walk me to the exit. He was lithe, dressed in flip-flops and jeans, carrying a small French dictionary filled with papers on which he’d written lists of conjugated verbs and vocabulary words, and paragraphs of English describing his education, his focus on engineering, and his ambition to continue with his studies. As we approached the boundary, Benjamin stopped talking and turned to face the dry expanse of trash-filled grassland, which I would soon leave, and he would not. We stood together in silence. Our position granted us a wide view of the camp, along with the only permanent features of so provisional a place: cobbled-together shacks, fire pits, and broken glass scattered in the sand. “This is freedom for me,” Benjamin said. Calais was a grim freedom. The camp—or The Jungle, as it came to be known by aid workers and refugees—was often described as the worst slum in Europe. Water and electrical systems were primitive. People washed their dishes, feet, and T-shirts at the same cold-water pipes, and charged their phones at the information centers, which were housed in decommissioned double-decker buses. The majority of shelters people slept in were holiday tents, sagging and shapeless from bad weather and overuse. The camp’s swelling population had resulted in overcrowding. The smell of sewage and rotting garbage first hit me from half a mile away when I turned my bicycle onto Rue de Greniere, the long road leading to the camp’s entrance. I wasn’t prepared for the poor conditions or the shortages of basic necessities. At the bottom of the main walkway, which was lined mostly by Afghan-run restaurants housed in dilapidated shacks made of particleboard and corrugated iron, there were usually at least fifty migrants lined up to use the ten or so portable toilets. Walking down a narrower path, opposite an Iraqi’s tent, were shops stocked sparsely with earbuds, phone chargers, cooking oil, toothbrushes, and rolls of single cigarettes piled in pyramids. Their owners often stopped me to ask for help obtaining shoes. Each day, hundreds of migrants waited outside the One Spirit Ashram marquee, one of a group of volunteer-run kitchens. It is not surprising that French president François Hollande’s given rationale for the demolition cited the living conditions. The aim was to transfer the camp’s population—10,188 in September, according to the final census conducted by L’Auberge Des Migrants—to sanitary housing. Bernard Cazeneuve, who was then the country’s interior minister, stated that the centers would offer shelter to those refugees eligible to apply for legal asylum in France. It was reported that between 5,000 and 6,000 migrants had left on government buses. But it was political expediency more than humanitarian concern that precipitated the action. Conditions had been appalling for more than a year and a half, which suggested to some aid organizations and charities that the camp’s closing was a bid by Hollande to boost his popularity. His decision not to run for reelection, in the hope that abdicating leadership would salvage support for his party’s platform, exposed the extent of his failure to unite France’s left-wing parties, particularly around issues of unemployment and immigration. Hollande’s plan for the people living in the Calais camp was not only hastily executed but also ill-conceived; he promised opportunities shadowed by uncertainty. “It is really likely that refugees will come back to Calais,” a French volunteer named Valentin told me. Many of the people newly installed in shelters had called him in the days following the evacuation, distressed that basic necessities were hard to come by. Conditions at some of the centers were no better than they had been at the camp, and the food offered was not halal. To make matters worse, many residents in rural villages were unabashedly racist. Some teenagers relocated to centers in northern Calais had been forced to pick apples for French supermarkets for no pay. In the long term, the reception centers do not present a viable solution for those intending to reach the United Kingdom. Care4Calais, a nonprofit that has continued working to end the refugee crisis in Northern France, estimates that a third of the refugees and migrants have family in the U.K. Many more want to go because they speak English better than they do French, and because France has a higher rate of unemployment. 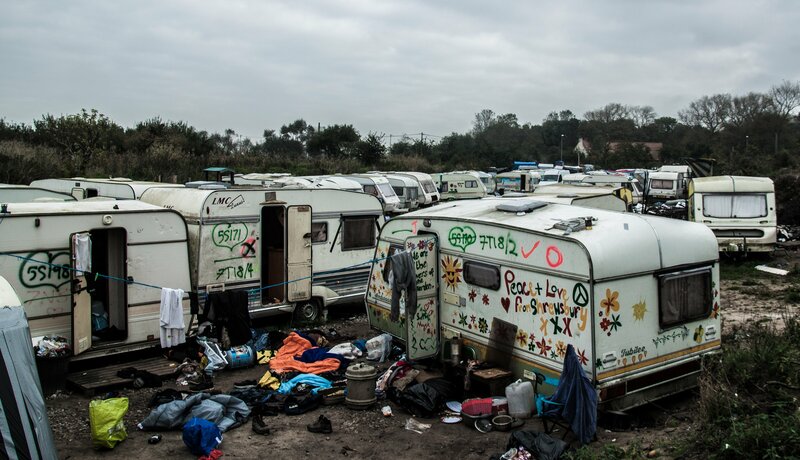 Though the camp may have vanished, its inhabitants will not; to many, Calais still seems their best hope. The recent demolition is one in a series of muddled efforts by France and the U.K. to protect the border—all of which has done little to prevent refugees from trying to overcome it. Without safe and legal routes, refugees hoping to get to the U.K. have created their own by attempting to climb inside vehicles bound for the ferry port or the Eurotunnel terminal. To block them, French authorities began construction work on a U.K.-funded concrete wall to run the length of both sides of the Rocade, the main dual carriageway leading to the port. Calais is a port city, and has long been a locus of migration. Refugees and migrants have been arriving there with the aim of reaching the U.K. since the opening of the Eurotunnel, in 1994. The first “jungle” established itself in Calais in 2002, in the form of makeshift shelters in the woods erected by Afghan and Iraqi Kurds. It arose after the closure of Sangatte, a reception center administered by the French Red Cross, and was shut down by the French government largely in response to xenophobic propaganda pedaled by the British tabloids. In 2003, France and the United Kingdom signed the Le Touquet treaty, a bilateral agreement that allowed British officials to carry out border checks in Calais, and French officials to do the same in Dover. As part of the agreement, the U.K. contributes funds to French police units working at the border. The French police I interacted with most often at the camp were riot police—a mobile unit called the Compagnies Républicaines de Sécurité. To many refugees, it appeared that France’s ongoing state of emergency, ordered after the terrorist attacks in Paris and Nice, had intensified hostility from law enforcement toward outsiders. At best, the camp’s demolition is an incoherent response to a complex crisis. And the proposed solution—evacuating refugees to randomly located and provisional centers—seems likely to perpetuate some of migration’s root causes: blocked safe routes to the United Kingdom, and processes for legal asylum that are both opaque and unreliable.